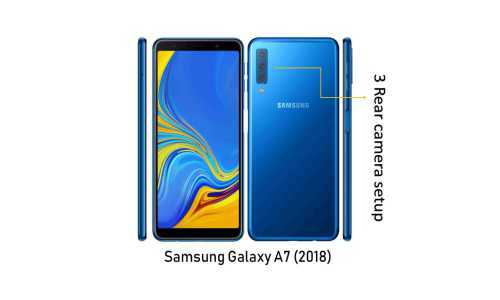 South Korean electronics company Samsung Mobiles launched its first triple-rear camera smartphone Samsung Galaxy A7 (2018). In collaboration, this phone of Samsung brand comes with three rear cameras. Speaking of other key features, the Samsung Galaxy A7 (2018) features a 6-inch full HD + Super AMOLED Infiniti display, Dolby Atomas audio technology, a fingerprint sensor on the edge and a self-camera 24-megapixel camera. Let's talk about Samsung Galaxy A7 (2018) in detail. Remember that Samsung had screened its budget smartphone Samsung Galaxy J4 + and Samsung Galaxy J6 + this week. These are to be launched in India by the end of the month. The price of the Samsung Galaxy A7 (2018) has not yet been revealed. However, Samsung has said it will be available in select European and Asian markets. In addition, Samsung will launch another smartphone on October 11. It is being speculated that this would be the company and the industry's first four-rear camera smartphone. This smartphone will be a member of the Galaxy A series family, confirmed by the company in a way. Dual-SIM Samsung Galaxy A7 (2018) Out of Box will run on Android 8.0 Orio. It has a 6-inch full-HD + (1080x2280 pixels) super AMOLED Infinity display. Aspect ratio is 18.5: 9. The octa-core chipset is used in the phone, whose clock speed is 2.2 GHz. There will be two variants based on RAM and storage - 4 GB of RAM and 64 GB storage, 6 GB RAM and 128 GB storage. The phone has support for MicroSD card up to 512 GB. As we mentioned earlier, Samsung Galaxy A7 (2018) has three rear cameras. This setup has a 24-megapixel autofocus sensor, which has an aperture F / 1.7. The second is an 8-megapixel Ultra-Wide Sensor with F / 2.4 aperture. Both of these sensors play with a depth of 5-megapixel depth sensor. Its aperture is F / 2.2. The 24-megapixel fixed focus sensor is provided on the front panel. It is equipped with F / 2.0 aperture, LED flash, Selfie Focus, and Pro Lightning mode. The Samsung Galaxy A7 (2018) connectivity features include 4G VoLTE, dual-band Wi-Fi 802.11 AC, Bluetooth 5.0, GPS, GLONASS, Baidu, and 3.5mm headphone jack. The battery is of 3300 mAh. The dimensions of the smartphone are 159.8x76.8x7.5 millimeters and weighing 168 grams Galaxy A7 (2018) has given an accelerometer, gyroscope, proximity sensor, RGB light sensor, and fingerprint sensors. Download Techtox express Android App for the latest tech news, smartphone reviews SEO services, application, know about blogging latest job science and affiliate marketing ETC.